Lec-Tricks. – Dirty wet dog , boats and sailing. 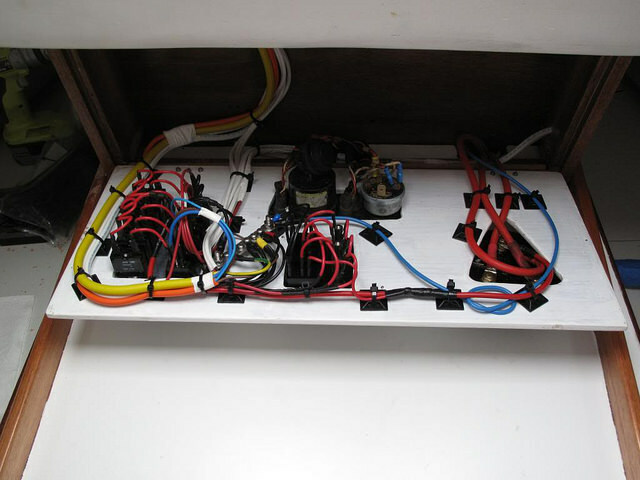 The lack of posting here is due to the amount of time i have spent down at the yard trying to sort out the boats electrics, although i wasn’t going to do this i have all-but ended up doing a total re wire : in fact at this stage only 1 wiring run will stay in place from the original and even that will be doing a different job. Today BTW is day 4 just on this project so that instead of being out in the river perfecting the new anchoring and reefing arrangements i have spent yet another day sitting hunched up in the tiny loo compartment or kneeling in just one tiny space (moan…whinge…moan) but at end of day everything aches and partially because it just achingly damp-cold down there. Day 4 then and today i finally started to plumb in the new wiring circuits as we now have . 2.New internal 12v switch panel mounted accessibly in the cabin. 4.New solar panel regulator to go with the new PV panel. Yesterday was i hope the low point of the job as i had most of the bits of the old system either half out or hanging loose as i started to disconnect the old wiring and its gubbins. The old wiring really was a total mess and i think it was the kind of day where i just got more and more fed-up with the number of bodges and noob mistakes i found in the old set up. Yesterday (day 3) was mainly about working out where to mount the main components, mounting them and then getting the new solar panel to actually charge the battery. So : here are a few of the individual jobs and the problems i have found with them so far. Solar panel. This is a small (20W) flexible marine unit and is designed to be attached to a gently curved surface so its attached to the sliding hatch with a small loop of slack wire under the hatch so that the hatch can slide backwards and forwards. First problem came in once i had wired the panel to the regulator and then the regulator to the battery using the new (to me) blue/brown coda. I wasn’t getting any charge but the regulator was recognising the batteries….turned out after a lot of faff that the idiot who wired the panel has got the polarity wrong so i had to reverse wire it….for a while i was convinced that it was me that got my blue/brown wrong . Here : the massively simplified layout with the new charge regulator, the new battery selector ….loads and loads of holes from the old mess…and just the back of the cockpit instruments and its power lead to clip into place. Charge regulator….is rated for higher than just the one 20W solar panel and should be able to take a second one when i get it which will be mounted on the opposite side on the cabin roof but will need a raised mount to get it over the lines that run that side. New battery selector switch….mounted and has its positive lead in from the battery as the old one fitted quite well. I next need a single thick lead to take power to the positive bus (power post) at the switch panel. New main switch panel. This has now moved from an awkward position in the tiny heads compartment out into the main cabin, not shown yet but is neatly face mounted on the main bulkhead, today i mounted the negative bus-bar, the positive power post and started to actually plumb in the first of the actual circuits after creating some more logical wiring runs yesterday. So far those are the circuits for the VHF, instruments and compass all wired in and led over the top of the heads bulkhead and all solidly secured. The negative bus cable is the bright yellow one (the only piece of heavy cable spare) several other circuits yet to mount : i will mention 1….the thinner orange one is currently the circuit for the navigation lights which has a run inside the boat and of course a long run (26 feet) up the rig, the cable inside the mast is decently thick but the run inside the boat which the previous owner put in is only 0.75 mm from a domestic 3 core flex and the old navigation lights were a standard bulb…so one of the highest rated and longest circuits on the boat had an owner added thinnest circuit cable possible !. That circuit will now become an internal lighting circuit as it goes to the right place and when i can get some will be replaced (for the nav lights ) with some 2.5mm flex at the least….the bulb at the masthead is also LED so should be minimal power wastage and lowest resistance. Make circuit for the tillerpilot. New circuit for the navigation lights. And wire up the switch panel itself which has an 8 gang switch run, a lighter socket which will fit my anchor light arrangement and a USB power port which i think will be useful. Final parts will be to cross fingers, power it up and hope that there isn’t a short but loud “fzzzzzark” and if its all good mount the switch cover box. The next stage of the re-wire if all is well will be to bring in a huge new battery of around 200 AH. After that the boat needs a massive clean and tidy as there is just carp evertwhere.